Well, Kuri had it in her purse first. Tell me oh, wise internets, you do have something strange in your purse right now, yes? This entry was posted in Friendship, Gardening. Bookmark the permalink. Nothing strange – just a small knitting project, in case of emergency. Don’t want to be caught in a line without one! Does a can of V-8 count as “strange”? Depends on what you consider strange…I have a fingerprint ink pad, but to me, that’s just necessary. Oh, wait! I do have something strange – I have a plastic tool for smoothing and writing in clay. I put it in there for something, but I can’t remember what. My purse could actually count as an overnight bag… I have diapers, wipes, toys, knitting, snacks and crayons – but absolutely no $$$! I don’t carry a purse usually. I’m at work, carry what I need in a pocket. At school, I’m carrying a book bag and an armload of books. I’d look darn funny with a zucchini in my pocket. hmm, I cleaned up my purse this morning, but until then I had an odd bit of plastic that is a burnishing tool for stained glass. Zucchini are the plant worlds secret weapon. They are getting us back for our failings towards mother nature. They replicate and try to bury us. I love it! 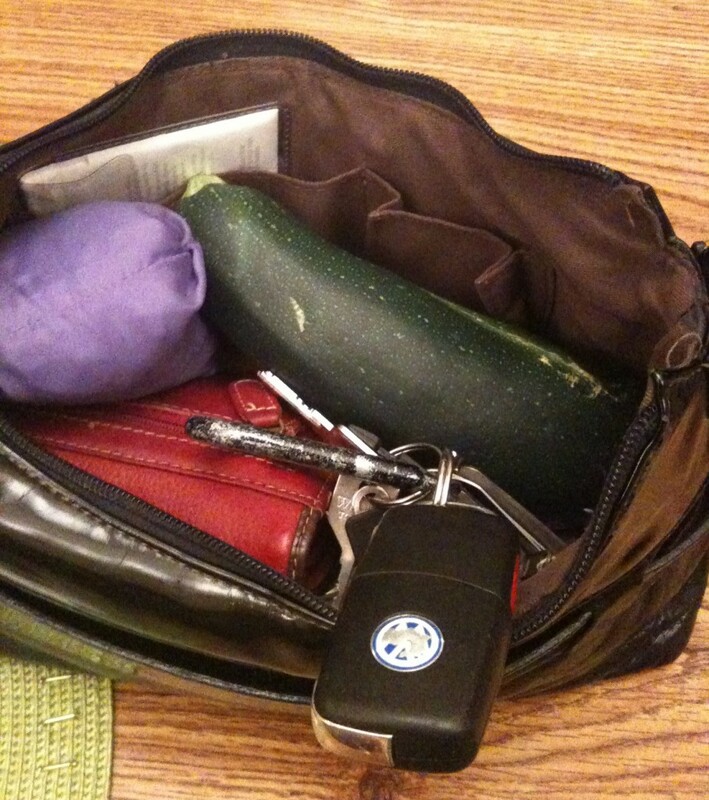 I recently had a cucumber in my purse. I also often have a banana. The worst was at church when I pulled out my lint roller and there, unbeknownst to me and stuck to the side, was a pad. My nephew loves to tease me about all the stuff I carry around with me! Why, no, I don’t, but that’s funny right there! A steak knife that was stolen from a very expensive restaurant. Never pass off a dare to a friend who has had a teensy bit too much to drink. I’m glad you mentioned it because I need to get it out of there before I set off some security alerts somewhere.